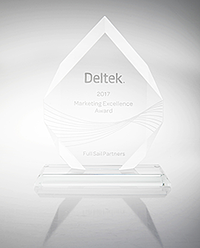 Full Sail Partners is honored and excited to have received the Deltek Partner Marketing Excellence Award for 2017. As a Deltek Platinum Partner, Full Sail Partners continues to provide sales, implementation, consulting, support and customization services for project-oriented professional services organizations. Our mission is to help businesses integrate their processes into one singular system, better understand and retain current customers, and increase market share. We leverage multiple inbound and outbound marketing strategies to drive awareness and strive to provide valuable content for Deltek Vision and Deltek for Professional Services users. “It is our honor to recognize Full Sail Partners with this year’s Deltek Partner Marketing Excellence Award. Full Sail Partners continues to deliver products, services and support that help our customers successfully grow their business,” said Ray Lazarine, Senior Marketing Director at Deltek. Both Deltek Vision and Deltek for Professional Services are leading enterprise software solutions designed for project-based professional services firms to improve business performance, streamline operations and win new business. With automation of marketing, financial management, planning, tracking and administration of resources and projects, these products uniquely integrate end-to-end business processes. Using the Blackbox Connector offering by Full Sail Partners, Deltek Vision and Deltek for Professional Service users can connect their systems to other third-party software solutions further streamlining business operations.